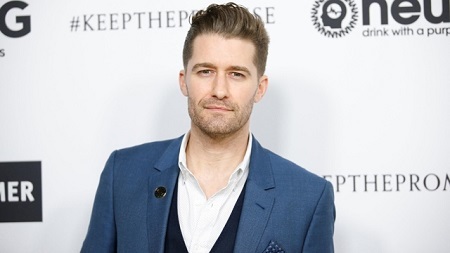 Glee Star Matthew Morrison is Happily Married to Renee Puente and has welcomed their new baby. Also, see his relationships and past affairs. A big shower of congratulations to Matthew and Renee!! Actor Matthew Morrison and the "High School Lover" actress Renee Puente welcomed their first baby boy this October. The couple has been married since 2014 and the new parents are very excited about the child. Let us find out in detail about the couple relationship. The lovebirds: Mathew and Renee tied the knot in an intimate Hawaiian ceremony on the island of Maui on October 18, 2014, after the 15 months of engagement. After the 3 years of happy relationship, the couple on May 17, 2017, gave a good news about them expecting their first child. Matthew so excited to welcome his baby with Renee his happiness and excitement through the Instagram posts. Finally, Matthew and Renee welcomed their son on October 23. The baby's name is Revel James Makai Morrison. The new father Morrison shared a heart-melting black-and-white snap of himself fist-bumping his first-born son. Similarly, Reene also shared the photo of the baby on his father's arm on her Instagram. With her emotional vow, she promised to cherish every moment with Matthew and newborn baby Ravel. "My Father's Day, we're actually going to be on our babymoon. We do feel like this will be our first Father's Day, we really celebrated Mother's Day this year for Renne. We'll be just enjoying our travels before we have our addition." Once again congratulations Matthew and Renee!! Was born on October 30, 1978, as Matthew James Morrison inFort Ord, California. Morrison did a musical with actress Jodie Sweetin while in school. Attended New York University's Tisch School of the Arts for two years and dropped out to join the Broadway adaptation of Footloose. His career took off after his musical theatre debut on Broadway in the musical version of Footloose. In 2015 he won in the category Favorite Actor in a Musical in Broadway.com Audience Award. His present wife Renee was previously married to Doug Stanhope.